On a clear, bright, sunny morning in mid September, a group of grade three students and adult volunteers are gathered on the sidewalk next to the garden area at the front of the school. Despite the sunshine, there is a chill in the air and the wind is blowing dry leaves in little circles at our feet. The purpose of this gathering is to plant bulbs in the school garden as a first step in a long-term activity that will promote learning in several curriculum areas during the school year. Ignoring the gusts of wind, the students listen carefully as the planting process is explained and demonstrated, and then each student is invited to select a daffodil bulb and a trowel from the wheelbarrow. Next comes the task of finding a special spot in the garden to plant. How exciting it is to plant these large bulbs knowing that they hold the promise of flowers in the spring! What is the Planting a Promise Program? How do I register my class for the Planting a Promise Program? BC teachers are invited to apply at the beginning of the school year by using the contact information listed below. Curriculum Connections, teacher background information, lesson plans with student activity sheets and photographs of daffodils in bloom are all provided on the website. What if I live outside of British Columbia? 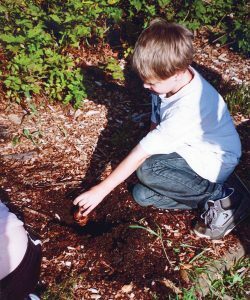 Planting a Promise: Daffodils at School is an excellent information package written by Jim Wiese and is available on the BC Agriculture in the Classroom Foundation website. It contains everything that you would need to know about starting your own project including a student activity booklet. All you need to do is provide the bulbs! 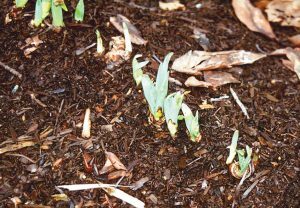 What steps do you take to grow daffodils in the school garden? Dig the leftover soil from the Spuds in Tubs Program into the soil or prepare a bed so the students will not have difficulty digging holes for the bulbs. Pick up the bulbs from one of the Program Partners listed in the start up information. Cut a bulb open and have the students examine it. Have them draw and label a bulb. Review the information from the earlier activities. Explain and demonstrate the planting process. Remind students of what they did in September when they planted the bulbs. Have the students return to the garden and locate one of the tiny shoots that are beginning to emerge from the soil. Measure the height of the shoot. 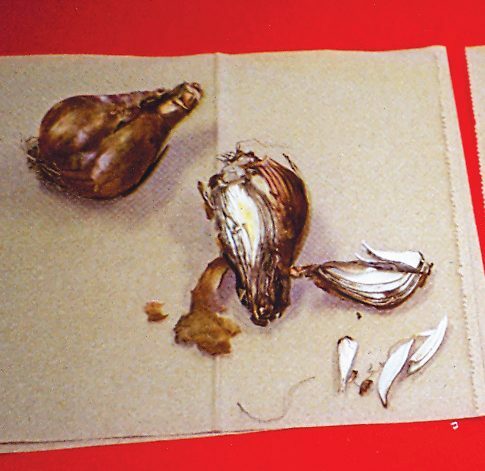 Uncover one the bulbs and examine the roots. Return to class and record the information. 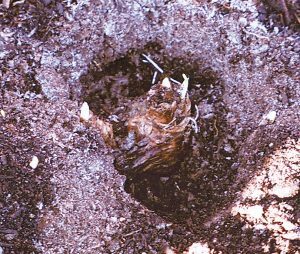 Once the shoots have emerged, have the students return to the garden and locate the bulbs that they planted. Have the students use a ruler to measure the height of their daffodil and record the information (bar graphs are included in the student information booklet). Have the students record the growth of their bulbs for two weeks. When the daffodil flowers bloom, have the students observe their flowers. Have the students draw and label their daffodils. A number of extension activities are included in the information package on the website. If you are contemplating any sort of school gardening project you might also want to check out the Agriculture in the Classroom Canada website (www.aitc.ca/bc/). AITC is a network of all the provincial Agriculture in the Classroom programs. 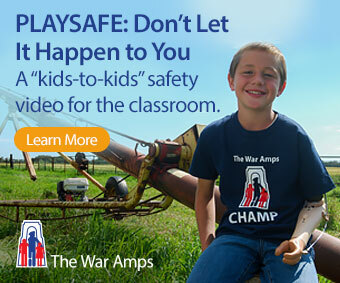 There you will find links to programs in your area, lists of resources, etc. You will also find information about Canadian Agriculture Literacy Week which is celebrated annually in March.